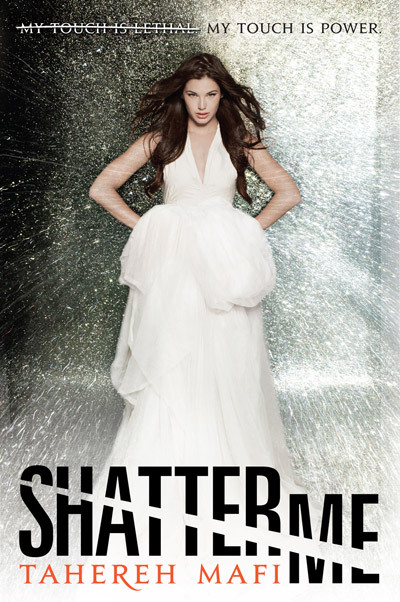 Shatter Me is one book that you're going to be hearing a LOT about this month--and for good reason! It is a stunningly awesome book that I absolutely could not get enough of! It's got the dystopia elements that are popular right now, but the best part about it is the narrator, Juliette, her unique powers and experiences reminiscent of a superhero, and the sizzling romance! I am beyond excited about this book, which is why I've made it the prize for November's commenter contest! How to win: Every time you post a significant comment that contributes to the conversation, I give you an entry into the contest! The more you comment, the more you entries you get! Only comments on posts from November 2011 are eligible, so keep coming back for more posts and more chances to comment. For all of the details, click here. Look for my review, coming soon, with more details about this awesome book. For now, just trust me when I say that you WANT TO WIN THIS BOOK. And of course, as always, it comes with awesome, fun swag! Enter away! I've always loved the cover for this book! It's in Australia now which is fantastic but isn't always the case. The only upside is that we get books by Australian authors first and then the rest of the world waits ages for them, e.g. Graffiti Moon which, yes, I've read. I had trepidation about wanting to read this book at first, but after reading all the awesome reviews about it, I really want to read it now. I was so on edge about this book, but every review about it seems to be raving. I think that since it's been hyped up since May, I just pushed it off. But it really does sounds like an amazing book and the cover is gorgeous. Great giveaway! I've read some great reviews for SHATTER ME. I'm still not too sure about that dress on the cover. A fabulous giveaway thank you. It must be awfully lonely to know that your touch can kill. What an isolated way to live. And no wonder people want her as a weapon. It's a lot like leprosy was in a way in the past - no one wanted to approach people with that kind of disease. This sounds like a very intriguing book. I would enjoy reading it. This book definitely sounds interesting. Unlike any book I have ever read. I'd like to win a copy of this book to see how it turns out. I actually saw this book from The Story Siren, and ever since then, I've wanted to read it. It seems dystopian--my favorite kind of book! ;) Also, it would be very materialistic of me to say this...but the cover is gorgeous. So, I hope to read this as soon as possible!